CUT and DRY : Blogging + Have an Inspiring Weekend! When I first started up my blog I had no idea if anyone would read my posts, what it would be like, what type of people would be visiting, what I was doing or what I was getting into. reciprocity. Yep, reciprocity, and reciprocal commenting is key. They say the social norms in the real world should apply to our blogging life and/or social life of online media. Reciprocity is into play in the aspects of social networking. I know we all have busy lives, but please take the time to comment on your favourite blogs. We all love comments. When you leave a comment on a blog post, your hope is they in return comment on your post as well. I don't know about you guys, but I always get so excited when I receive feedback on my blog. It just makes me happy to know that there are people out there that are enjoying my photos and posts, or that maybe in some small way I touched a reader's heart. It's absolutely amazing the way we inspire and support each other. Actually, I was lucky enough to have "met" some incredible people along the way. It's funny how you read about someone's life and you feel as if you have known them on a personal level! One thing I did know from day one was that I wanted to share the things that I love and are special to me, be inspired and hopefully inspire others on the way. This is still my goal. I want to take the opportunity to thank you all for reading Cut and Dry. I really appreciate you all more than you'll ever know. Two random photos for you. A shipyard, as seen through my eyes. Drakes Island from Torpoint, Cornwall. So, what are your plans for the weekend? As for me, oh, I have so many distractions calling for my attention. Inevitably. You are like your photos--beautiful. I appreciate you too! Your concept of reciprocation is a view that I share. (I'm not legalistic about a 1:1 ratio. You post more frequently than I do, and have many more people who comment. So I do not expect you to comment on my blog as frequently as I do on yours.) The general principle seems so reasonable, that I regard it as self-evident. Weekend plans? I have an important discussion/debate this weekend, and I have been studying hard to prep for it. I trust my colleagues (and opponents) have done the same. So, my weekend will be spent scribbling on a notepad, and with my nose in books. These scenes are delightful. I love to experiment with digital effects and exploring how they might convey different emotions. Estoy de acuerdo contigo en lo que dices de la amistad con blogger. Unos pintorescos cielos de belleza de imágenes que nos has dejado. Con tu permiso he conservado una quizás para un futuro cuadro. Beautiful skies, glorious colors and superb captures, Betty!! I love them and the different things you have done with them!! Awesome! Hope you have a wonderful weekend!!! Mari, cual para el cuadro? Me gusta el ultimo que se llama "Drake's Island." Yo puedo ver algo asi para una pared en mi casa o en la oficina. 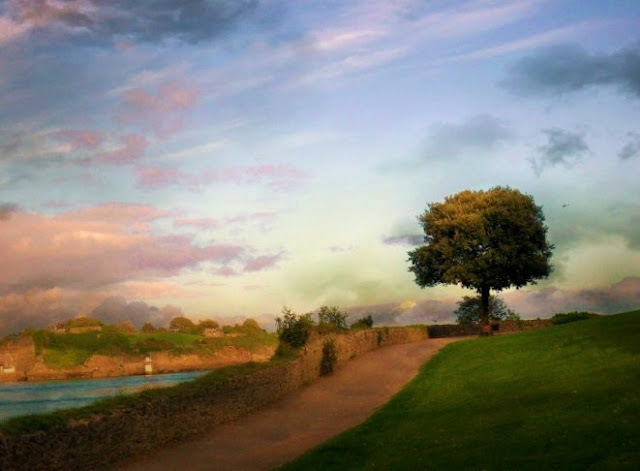 Betty, that last painted photo of Drake's Island is pure magic! I love it! Lovely photos, but just love that 1st shot. I am happy for you enjoying your blog.Have a nice weekend! so beautiful, i love the blue one and the one that is so colorful above the painting with camera words. you did capture God's amazing sky and the photos are spectacular, all of them. I know what you mean about blogging, although I never thought about inspiring anyone. There are some wonderful, amazing people around the blogosphere! You are one of them! Big Hugs and have a great weekend! Wonderful colours indeed. Yes, blogging changed life. Thought me a lot. Brought me a two year contract with a picture agency. Hopefully remains possible. Brilliant colouring, and, you give love out and you get it back, cheers Betty. Έτσι όπως τα είπες είναι !!!!!!! Υπέροχες οι ζωγραφικές σου φωτογραφίες (ειδικά αυτη με τα καραβάκια απίστευτη) !!!!! Και η τελευταία πίνακας κανονικός !!!! Beautiful pictures, I love those beautiful colors and sublime creativity of these beautiful compositions, a hug. Niestety zasady wzajemności nie wszyscy blogowicze przestrzegają i to jest przykre. Zdjęcia są cudowne. Miłego weekendu. Pozdrawiam. Unfortunately, the principle of reciprocity does not comply with all the bloggers and that is sad. The pictures are wonderful. Have a nice weekend. Yours. Wow! These are amazing! The blue / yellow sunset one is terrific! Your words, too are beautiful, both here and in your comments on our blogs, and that explains why we follow you! I have 29 followers, and feel I know them all through their blogs and their kind words on mine. Keep up the good work Betty! Have a great weekend yourself, I am watching the Korean Grand Prix and going to a Vintage Fashion fair. That first picture makes me feel like I'm looking at the actual sun. I can feel it's warmth and I'm afraid to stare at it too long. Very cool. Wow you have some stunning images here - I especially love your very first one. Extremely well and wisely put! 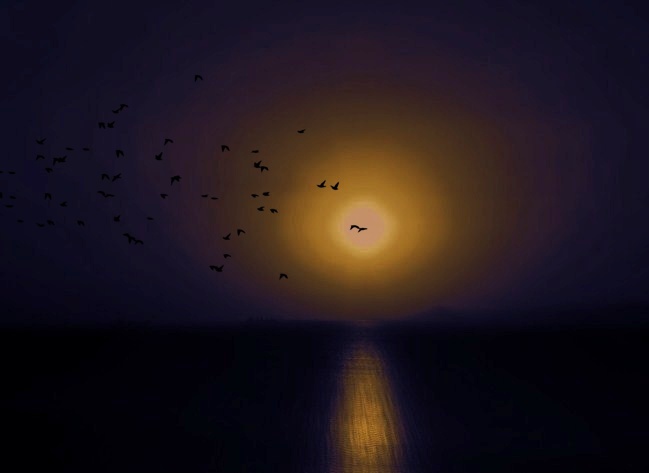 Beautiful photos and creative images Betty dear, the blue sunset is lovely. I treasure the opinions of my followers and the friendships we have formed, if it was not for all of their comments I would just be writing for myself. Have a great weekend Betty dear. I really like the way you paint with your camera. I know what you mean about meeting wonderful people through blogging. I've met many marvelous people ( including you) through blogging, even if I've never met them in person. And you must have met one of the funniest people in the world. You, and your photos, are beautiful. This is the second post I read on Bloggers and Blogging. Reciprocal mind is necessary for Blogging . I agree with you. And again let me say your pics are like paintings , splash of colours in harmony! I saw you in my dreams..
You tried to fix the outlook on my blog (how strange). Your photography you created new colors with PS is marvelous!! Wish you a nice weekend and stay as you are. A beautiful mind!! 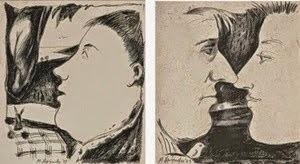 Bonitas imágenes y muy pictóricas, sobre todo la primera que parece una pintura impresionista. Betty, I love visiting your blog, your photos are just beautiful. Meeting new friends thru blogging is great. I also feel like I am traveling to new and exciting places thru blogging. Wonderful post and I wish you a very happy weekend. You have a beautiful blog - I'm so glad I found it! Felicitaciones Betty por estas bonitas fotografías. Me gusta mucho sus procesados, muy vistosas. Un cordial saludo feliz fin de semana, a mí me toca trabajar. Wow! Awesome post. The pictures are absolutely beautiful and your views on blogging are spot on. I have met so many wonderful persons since I started my Blog. It is a long holiday weekend in Jamaica. I will spend it relaxing at home, listening to music, watching television and of course blogging. Have a good weekend. Fantastic pics! Glad I found the blog I can comment on :) I follow the other one too. Thank you for welcoming me to your blog. I've been absent for a while and I missed popping in to see what you're up to. My favourite photo is Bantham Beach. There's something interesting about the framing. The way the fence tilts around the grasses. 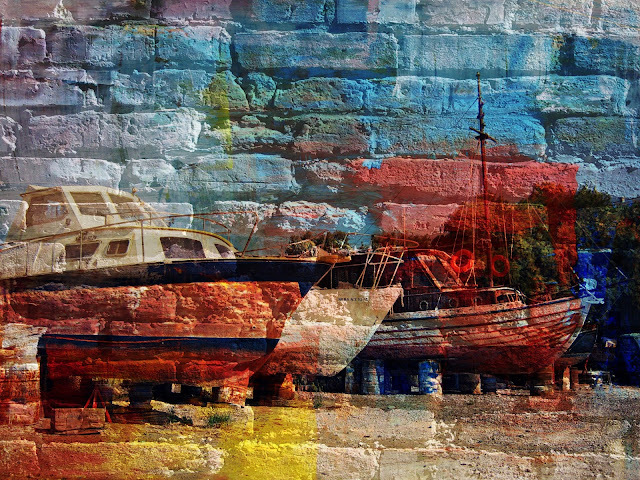 Also the layering splashes of colour over the boats and brick wall in the Illusion in a shipyard. Beautiful photography Betty. Wish you a wonderful sunday. I've been browsing online more than 4 hours today, yet I never found any interesting article like yours. It is pretty worth enough for me. In my view, if all webmasters and bloggers made good content as you did, the internet will be much more useful than ever before. It is a law, the law of reciprocy. Lovely photos, especially the boats. Blessings. You say it so well. We show up for each other and support each other. It's amazing. Loving your photos and edits Betty. I haven't been so good at leaving comments, lately and I apologize for that. I expect my blogging and visiting will get back to "normal" in a few weeks. Changes are afoot! I love all the photos but that last one is just beautiful! love your smashing shots today, and understand. Wishing you well. I hear you, Betty re: blogging - I've had to cut back too, although I don't even have a dedicated blogging day. It's tough to keep up with all the wonderful blogs out there. But these are gorgeous photos (as is the one on your most recent post). It certainly does take a lot of time, this blogging thing! I am busy as well but take the time to reply as much as i can but it is hard to keep up sometimes, don't you think? Your pics are stunning Betty! Re your plans for your blog, I totally understand you. Blogging sometimes almost a 9-5 job. I loved those photos, especially the first one. Beautiful effect. First let me tell you, I LOVE the blog!! The pictures are just gorgeous and it appeals to my elegant side. Second, I totally wish that others would understand the reciprocity of bloggerdom. I am glad you posted this. I do my very best to return every visit to my blog and, though I do understand that I am an acquired taste and many will have nothing to say, it always shocks me when I have taken the time to actually read something and comment, they don't do the same. THANK you for this post! You said what many think! What a wonderful post and such lovely photos. I agree, it's all about reciprocating. I have made some wonderful friends through blogging. People I didn't even know a year ago, but now I look forward to visiting them each day. the detox diva, i really appreciate your efforts you put into the blogging community and thank you for being such a reciprocal blogger. ...ciao Betty, perdona la mia assenza dal tuo favoloso blog. Ho letto la tua disamina sulla comunicazione che oggi tutto il mondo può usufruire tramite la grande porta aperta di Internet. Concordo sui concetti che hai voluto trasmettere. Come è vero che i commenti fanno piacere quando li troviamo sul nostro blog! E' un modo di sentire che non si è soli, in questo mondo che tende sempre più all'indifferenza. Ora ho messo il tuo blog fra i miei preferiti, così posso seguire le tante meravigliose foto che pubblichi, e le tue parole che riflettono sempre una realtà, tua, e di tutti...con sincero affetto..
Well shoot, only the first and last photos came up for me. The two that did however are beautiful! First, I LOVE your pictures! Second, as a blogger I loved your post. I too have made friends and thank my readers for the opportunity to share. beautiful photos and terrific post my friend. Thank you for sharing at the Thursday Favorite Things hop xo P.S. did you enter my latest giveaway? Your photos are amazing! I really appreciate your visit and comment. Will be back to check your other beautiful post..
Beautiful photos. You are a very talented photographer. Thanks for visiting my blog. Howdy just wanted to give you a brief heads up and let you know a few of the images aren't loading properly. I'm not sure why but I think its a linking issue. I've tried it in two different web browsers and both show the same results. [url=http://lucyfer2.comuv.com/viewtopic.php?f=11&t=1134&p=5164#p5164] my site[/url] Hello There. I found your blog using msn. This is a very well written article. I’ll be sure to bookmark it and return to read more of your useful information. Thanks for the post. I’ll certainly comeback. Thank you for any other informative web site. The place else could I am getting that kind of info written in such a perfect manner? I have a undertaking that I'm just now working on, and I've been at the glance out for such info. I have been checking out a few of your posts and i can state pretty good stuff. I will make sure to bookmark your site. [url=http://www.latin-residence.ro/index.php?view=detail&id=42&option=com_joomgallery&Itemid=9] Extra resources[/url] Hi! Someone in my Facebook group shared this website with us so I came to check it out. I'm definitely enjoying the information. I'm bookmarking and will be tweeting this to my followers! Terrific blog and amazing design and style. I do enjoy the way you have framed this specific concern plus it really does give me some fodder for thought. On the other hand, coming from just what I have observed, I only hope when other commentary pack on that men and women continue to be on point and in no way embark on a tirade of the news of the day. Still, thank you for this fantastic point and even though I can not really go along with the idea in totality, I regard your point of view. Betty, I wanted to reply to this but it seems I did not do so already! I wanted to say, yes, yes, yes!!! So many bloggers churn out 5 or 7 posts a week, never replying to or reciprocating comments and it doesn't work. Sure, there are times, weeks even, where I can't keep up but I do believe in supporting each and every one of my fellow blogging friends and I am glad that you do too. Thank you for this beautiful post and the wonderful pictures. Re your thoughts on blogging thing I totally agree. Can I just say what a relief to discover someone that truly understands what they're talking about on the net. You definitely realize how to bring a problem to light and make it important. More and more people have to check this out and understand this side of the story. I was surprised you are not more popular because you certainly possess the gift. enjoyed browsing your weblog posts. After all I'll be subscribing for your feed and I hope you write once more very soon! Hey there! I've been following your website for a long time now and finally got the courage to go ahead and give you a shout out from Kingwood Tx! Just wanted to say keep up the great work! After looking into a number of the articles on your site, I seriously appreciate your way of blogging. Superb post but I was wondering if you could write a litte more on this topic? I'd be very thankful if you could elaborate a little bit more. Bless you!